"To Inspire & Be Inspired, To Serve & Continue Serving"
Want to discover the essence of a YIN practice infused with the wisdom of Traditional Chinese Medicine? This is your chance to experience the real benefits of YIN Yoga practice and how it will help you with your Yang yoga practice and other physical activities. This Course will also introduce you to the mental benefits of being in Yin practice by holding poses longer, allowing the mind the focus & settle. *** YallaYogis get a 20% discount, make sure to ask for you discount code. Yin Yoga 50Hr certificate with Alena Calinescu- GoodLife Fitness – 2013. Through her passion for Yoga, Rula is now one of the directors and founding member of the NGO Yoga Mandala Project- Providing refugee communities in Jordan with psychosocial Yoga & Trauma related sessions. The YMP also helps build the Yoga teachers’ community through offering an annual Trauma Sensitive Yoga Trainings which provides Yoga teachers with the tool on how to lead a trauma sensitive yoga class and the opportunity to volunteer at one of our regular Yoga classes with the refugee communities. Like Rula’s page Rula Ananda & Ananda Yoga so you stay tuned to where and when she organized yin Yoga master classes and workshops. Or pick up any Family Flavors magazine and look for her monthly article contribution. Yin Yoga is the Yoga of surrender,,, join me for a journey of going deep into our tissues, thoughts & breath and come out ready to transform your practice. 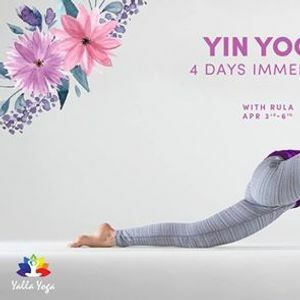 Yin Yoga is a balancing practice which will reshape how you approach Yoga, how you practice Yoga & will allow you to slow down & deeply connect with your practice physically & mentally. If you are a YOGA Teacher or you've been into YOGA and would like to share the benefits of YOGA with others. Join our YIN Yoga Emersion Course and become more aware of your movement and practice.